BBC’s “Doctor Who” is one of the longest-running TV series with hundreds of episodes today that span decades, and beloved by many. Thanks to the duration of its run, fans span across all ages; from kids to adolescents to, well, even to your grandma’s generations. Travel’s must-visits for Whovians who visit London would, of course, include the the Who shooting locations. The London’s Eye is one of the very first spots introduced in the newly revived Doctor Who series in 2005. The very first episode of what fans often referred to as NuWho, titled “Rose”, remains one of the most popular and most-watched episodes of Doctor Who of both the classic and the 2005 series. The episode reintroduced a villain from the classic Who series, the Auton, or the Nestene Consciousness. Their ability is to manipulate plastics. 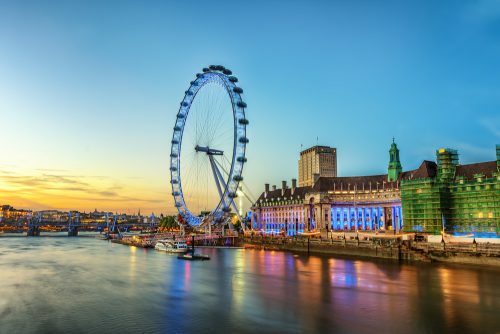 The Ninth Doctor started “The shop window dummy, phones, wires, the cables..” Rose added, “The breast implants—“ The London Eye is located on the South Bank of the River Thames, with the nearest underground station being London’s Waterloo station. The Globe Theatre appeared during the third series of the NuWho where the Tenth Doctor traveled with his companion, Martha Jones, and met Shakespeare. This place was featured in the TV series titled the Shakespeare Code. The villain of the story is Carrionite, a species of Witch from the planet Rexel. Their power is a word-based science that could shape reality, and in the Who series, was described as Witchcraft. The Globe Theatre of the modern time is a reconstruction of the demolished building and it was based on past buildings. You can find the Shakespeare Globe less than fifteen minutes walk away from the London Bridge railway station, or less than 5 minutes drive by car. The Slitheen is one of the main villains in the first series of the resurrected Who in 2005. With Christopher Eccleston and Billie Piper trying to save these green-skinned aliens from invading the earth through London. The famous 10 Downing Street is the British Prime Minister’s Office in real life. It has been designated to the prime ministers since 1735. The locals sometimes simply referred to it colloquially as “Number 10”. Apparently, the area around what is now known as the Downing Street had been a prestigious and important spot for government dated as far back as 1,000 years ago. It was home to Anglo-Saxon, Norman settlements, as well as the ancient Romans. Spot the Blue Police Phone Box; the TARDIS in London! The infamous TARDIS—Time and Relative Dimension in Space—is the Doctor’s time and space ship he/she (they?) use to travel throughout the series. The design is actually just a regular London police phone box used in England from the 1920s. These days, the police phone box is hardly used anymore, although a few do exist up until now. However, these days, the blue police box is associated far more intimately with none other than the BBC’s Doctor Who. Whenever they spotted a blue police phone box, “It’s a TARDIS!” One of the most popular spots to find a TARDIS is near the Earl’s Court Station. The TARDIS has been “parked” here and it’s a place that attracts geeks every single day.